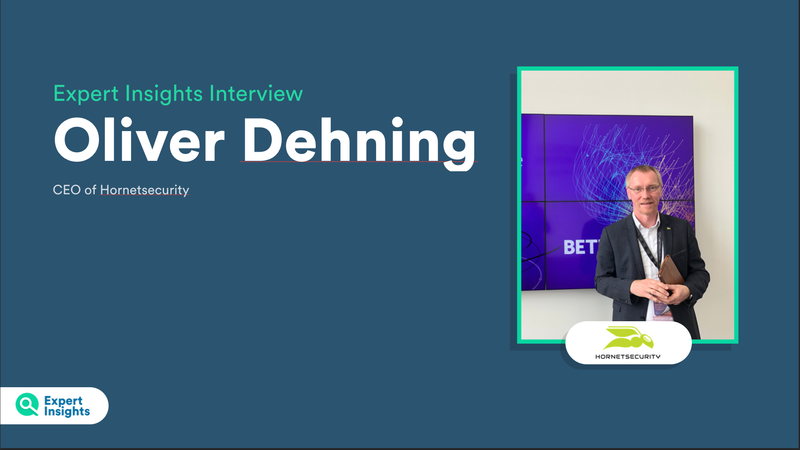 Expert Insights speaks to Oliver Dehning, CEO of Hornetsecurity, the largest email security vendor in Germany, about their platform and how it’s helping businesses to stay secure. Hornetsecurity is a cloud security service provider headquartered in Germany. It was founded in 2007, and has expanded out rapidly since then, becoming the largest email security provider in Germany and central Europe. It’s now making significant moves into the USA market, hoping to bring easy to manage and user friendly email security to an even larger market. They’ve recently expanded with the purchase of Spamina, an email security vendor focused on the Spanish and Latin American market. Expert Insights sat down with Hornetsecurity CEO and Co-founder Oliver Dehning at RSA 2019, to talk about the platform and how it’s moving forward in a world of changing security threats. Would it be fair to say that Hornetsecurity is the top Security Vendor in Germany? Well, it’s a little difficult to say because the market is fragmented. But in our segment, of email security, there are stats that say we are number one. We are also number one in Austria, in the UK our reseller and partner Everycloud is fourth or third, so we’re very much at the top. Together with Spamina, in Spain we’re now number one. If you look at this market segment in Germany, everyone will know about us. If you’re looking for email security and you don’t find Hornetsecurity than you haven’t looked. How has Hornetsecurity got to that position? What resonates with customers about this platform? This marketplace is crowded, it’s fragmented. There are probably 10 or 20 companies that are providing a generally similar service. But many of them only have an ‘OK’ quality. We also have lots and lots of features, things that the others don’t have, that does the trick. But I tend to say that that’s not our USP. Our USP is how we regard the business. One important aspect of email is that compared to your total IT budget, you’re only paying a small amount of money to protect emails. But, if something goes wrong with email, if it doesn’t work, it disrupts your whole business. Your whole business just stops functioning. And so, people are very careful in the email space. Our prices are good, our quality is good, and people don’t want to take a chance when it comes to email. That’s what we experience. Our retention rates are really, really high. So, we have a steady business and we can focus on winning new customers. The paradigm shift from on-premise to cloud computing is our opportunity. When you’re about to move to the cloud, you will evaluate your email security anyway. That’s where we come in. Do companies moving to Office 365 and other cloud based email providers still need third party email security? Absolutely. Of course, you can use Microsoft, they have email security built into that solution. The question is, is it good enough? In many aspects it’s not. I think there are Gartner figures that say at least 40% of customers that go to O365 add another security solution in the next six months. Is that something that resonates with Hornet, have you noticed many companies moving to the cloud and then realizing that actually they still do need an extra layer of security? It’s started happening. In Germany, very few companies have moved into the cloud for their emails. Most of them still run their own Exchange server. In the US and the UK, it’s different. There, we see more companies moving to the cloud. For them we offer our new email security product 365 Total Protection. It wraps an email security layer around Office 365 and it’s very, very easy to deploy. Is this new focus on Office 365 because you’re starting to move more into the American market? That’s one reason. The other is that we think that Microsoft is eventually going to become big in the cloud market everywhere. I refuse to believe Microsoft will have the same dominance in the cloud market as they had in the on-premise market, but it will be a substantial portion that will go to Microsoft. At least 40% if not more than that will go to Officer 365 for email. So, we see it as an important part of the market. What are the main email security problems that people are coming to Hornet for help with? We still see a lot of ransomware. The number of viruses has gone up quite a bit in recent years. Instead of sending massive amounts of email spamHackers have realised it’s wiser for them to have more targeted attacks. So, what is growing quite a bit is spear-phishing. I actually see it personally, attacks targeted at me and if you look at them closely, they’re pretty good. For someone without training it can be very difficult to spot. Is spear-phishing a security problem that Hornetsecurity is focussing on? Yeah, that’s what we do with our Advanced Threat Protection. We rolled that out in 2016 and it’s really been a boost for us. We’ve spoken to a lot of vendors that are talking about post-delivery protection, working inside the email inbox to protect businesses from insider threats and phishing attack. What are your thoughts on this new trend in the email security market? I think with that approach you still have the problem that the emails are coming in in the first place. There’s still an opportunity to click and cause something bad, before the security measure has worked and found the threat..
Also, the gateway does not only do spam filtering, it does a lot of things. You can have all kinds of policies around your emails. You can do that with O365 too, but with us it is much more powerful. And what if you have an on-premise server in one office but are on Office 365 in another? You need some kind of gateway to handle that, which is what we do. Where do you see the overall email market going? We started the business more than ten years ago. What we’ve seen is how fragmented the market has become. 10 years ago, we saw acquisitions, for example MessageLabs was acquired. Now we are seeing again, more acquisitions, more things going on at Microsoft and a lot of newer players coming in. The funny thing is that there were predictions that the market would eventually collapse, and everything would be in the hands of three or four players. But that’s still not the case. Do you think you’re going to buy more companies? Not right now. We’re working on making Spamina a success. We really want to become number one in all of Europe and continue growing fast, whether that’s through organic growth or not, is unimportant to us. The cyber security market has become huge. There are 3,000 vendors out there, and as a customer you have to ask, what are you selling and how is that different to the last company I spoke to?